Welcome to the resources page for biopharmaceutical applications. Here you'll find the following resources showcasing how the FlowCam imaging particle analyzer has been used for biopharmaceutical research: eBooks, videos, case studies, published research papers, white papers, product brochures, posters, articles, and blog posts. Visit the Particle Analysis for Biopharmaceuticals page for an explanation of how the FlowCam works and a list of instruments used in this research. 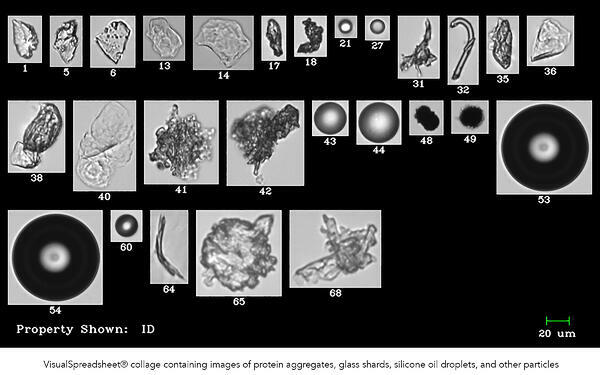 FlowCam Nano Provides Counts, Sizes, and Images of nano-and Microparticles: Application to a Therapeutic Protein Pumping Study, Cheng Her et al. Nanoparticle Impurities in Sucrose Promote Aggregation of Intravenous Immunoglobulin During Agitation Stress, Pardee and Carpenter. Comparison of Manual Pipetting vs. Automated Liquid Handler Pipetting into FlowCam 8100, Brown et al. Aggregates and Particle Characterization to Support Biomanufacturing Process Development, Mpanda et al. A Comparison of Methods for Quantifying Silicone Droplets in Biologics Using Dynamic Imaging Particle Analysis, Brown and Bernt. The Importance of Thresholding In Imaging Analysis of Protein Aggregations, Brown and Bernt. The Importance of Image Quality in Quantifying Protein Aggregation Using Imaging Particle Analysis, Lew Brown. FlowCam Technology for Monitoring Particles in Protein Therapeutic Formulations, Palmlund et al. Glass Shard Detection in Protein Therapeutics Using Dynamic Imaging Particle Analysis, Brown and Spaulding. Flow Imaging of Subvisible Protein Particles: Moving Towards Best Practices, Manning et al. The Importance of Thresholding in Imaging Analysis of Protein Aggregates, Brown. What Does "Orthogonal Method" Mean for Particle Analysis?